1.1 There is much more to explore other than the Leaning Tower. There is much more to explore other than the Leaning Tower. No filter needed in sunny Pisa. Pisa has been spruced up over the last few years and is looking great, there’s much more to the town than the Leaning Tower. With its central location and international airport it’s a great base for discovering Tuscany. Pisa is obviously well known all over the world for the bell tower of its Cathedral, the Duomo of Pisa, situated in Square of Miracles (Piazza dei Miracoli). But the Cathedral, with the nearby marvellous St. John baptistery (the biggest baptistery building in Italy), is not the only church in Pisa. By walking through the city, you can visit others churches, like the the Gothic-Romanesque church of San Michele in Borgo, or the small church of Santa Maria della Spina, a beautiful church in Pisan Gothic style situated on the Arno’s riversides, the so called Lungarni. Also the church of Santa Caterina d’Alessandria deserve a visit. 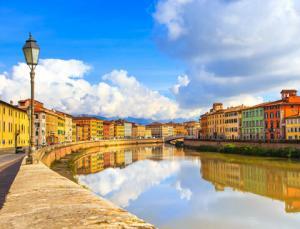 Walking through the historic centre of Pisa you can admire the history of architecture in Tuscany during the centuries. Proceeding towards the historic centre of Pisa, you can admire the superb Knights’ Square (Piazza dei Cavalieri). This square was designed and remodelled by Giorgio Vasari in the XVI century to host the headquarters of the Order of the Knights of Saint Stephen, founded by Cosmo de Medici in 1561. By walking, you can reach Borgo Stretto, the real medieval heart of Pisa, with its beautiful palaces and arcades. Here you will see the house where Galileo Galilei was born. From here you can reach the Arno River and cross the Middle Bridge to enjoy a real amazing view of the Arno riversides. Enjoying Pisa is not only visiting monuments, squares and churches. Pisa is full of small boutiques of italian artisans producing real masterpieces, like jewels and souvenirs. Walking in the small streets of the Pisa historic centre you can buy unique italian manufactured goods. During your shopping, also, you can have a break in one of the many restaurants where you can taste the real italian cuisine, enjoying the best italian foods with authentic tuscan wines. 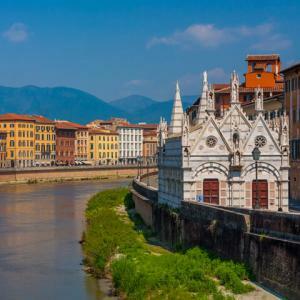 Take our walking tour in Pisa, the best walking tour in Pisa from Pisa’s people.